Just imagine: if you could get a tiny piece of a gracious London Park and lay it down gently within earshot of the sound of the waves lapping on the shingle of the seashore. Regent’s Park: one of the better things which came out of the reign of the Prince Regent, later George IV. George looked up architect John Nash, the man who was an icon in English architecture of the time (think Bucks Palace, Brighton Pavillion, Park Square). But Nash did not design Regents Park alone. He got a youngster to help him: one Decimus Burton. Remember him? The man who, along with his son James, created a brand new seaside resort just outside Hastings? There in St Leonard’s, just a short walk from Hastings Pier, you have only to walk along the coast path and turn right after Marine Parade. Keep walking and you’ll see it: a broad gatehouse, a whole white building which tantalises with an archway into another world. Inside is the tiniest little microcosm of London Park, a secret garden hidden away within artfully designed houses. In 1828, the gardens were opened as the jewel in the crown of the new seaside resort on the Sussex coast. It was a garden for the privileged: you had to pay to gain access to its left inner sanctum, around 25 shillings a year. St Leonards Gardens was bought by the town for £9,000 in 1879, and it has been public space ever since. It is the most beautiful little conglomeration of lawn and winding path, using the levels of the land’s plunge towards the coast. 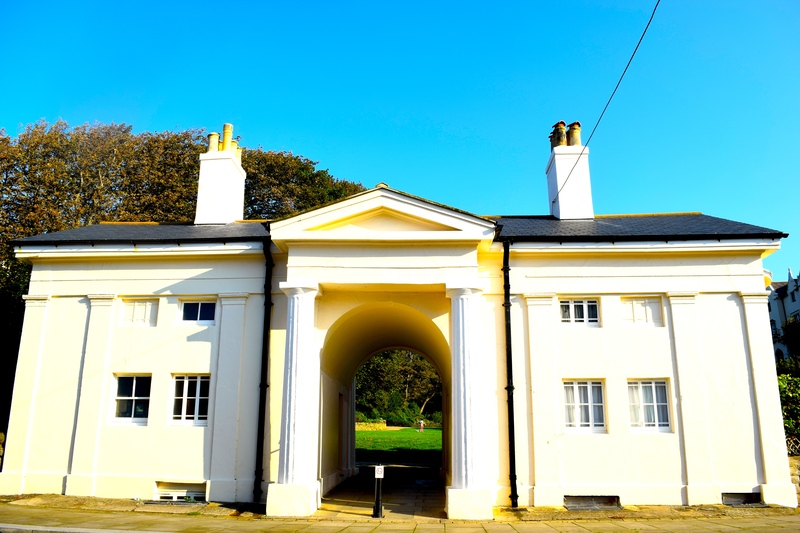 You can sit on a bench high up in the park and gaze past the gatehouse and the houses to the glistening sea. I spent a long time taking photographs there early one morning. But I lost a whole tranche of them, and I am heartbroken. The ones that are left do not have the light of the morning I sat in that beloved little space. But if you ever find yourself at Hastings Pier, take a detour. 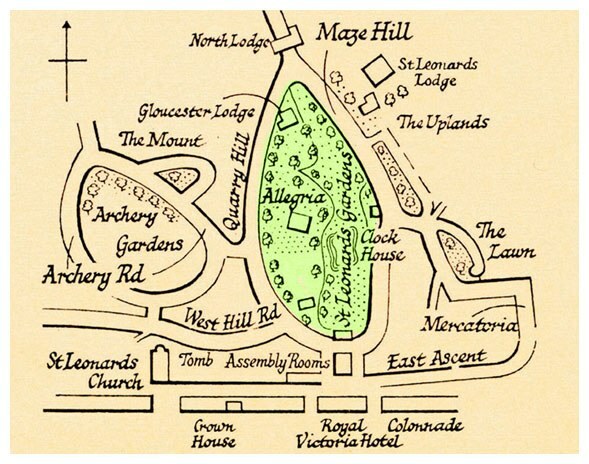 Turn towards St Leonards and go to find The Secret Garden. Take a book with you, and a flask of cocoa. Watch the dog walkers corralling their charges and the amblers and ramblers taking the air. They choose this over the sea. It is a special place indeed. Posted in UncategorizedTagged history, James Burton, St Leonards Park, st leonardsdecimus buron, sussexBookmark the permalink. I believe that I might also choose it over the sea Kate. It does sound like a special place. I never would have believed that one could re-park a park – shhh! You’ll have all the in-landers moving theirs! I think the secret is out, Col. Gentrification is on its way. Kate, there you go again, getting me lost in your words and wandering through your imagination. One more time you sent me to Google maps to research the area and then drop into street view so I could virtually wander the area. The scent of the sea mixing with the sights and the sounds of the area … well, that was what was going through my mind anyway. You have the disquieting and magnetizing ability to make me homesick for a place I have never been. Wanderlust, you say? Maybe time for a vacation. Indeed. You could come and see it for yourself, Michael, and it would not disappoint, I promise, as long as you avoid the rainy days! What a fabulous comment. That’s one for my pinboard. Thank you so much. Oh, Debra, I had some much more beautiful photographs but made an error and lost them….these do not really do the place justice, but at least they give a flavour. The place is beloved of the locals- I believe there’s even a management committee, and the gatehouse has an exhibition about the garden and the original resort created by the Burtonfamily of architects. What a pity in slide No. 5 were the TV aerials to spoil such a gracious building. Sacrilegious! We face a constant challenge here in the UK Brian: so many of our listed buildings are habitations, still loved and lived in to this day. Such little signs of 21st century life are all part of our balancing act. It really is beautiful, Brenda. I shall go back there one day in the right light and get those photographs all over again. Oh, I would love this, Kate. I think I would take “The Secret Garden” to this secret garden and spend a lovely day there.